Primitive Hand Painted Snowmen Stacker Blocks Set of 2. Adorable stackable blocks for your Home's winter decor. Who doesn't LOVE snowmen!!! I know I do, and they are great to leave out for the winter! 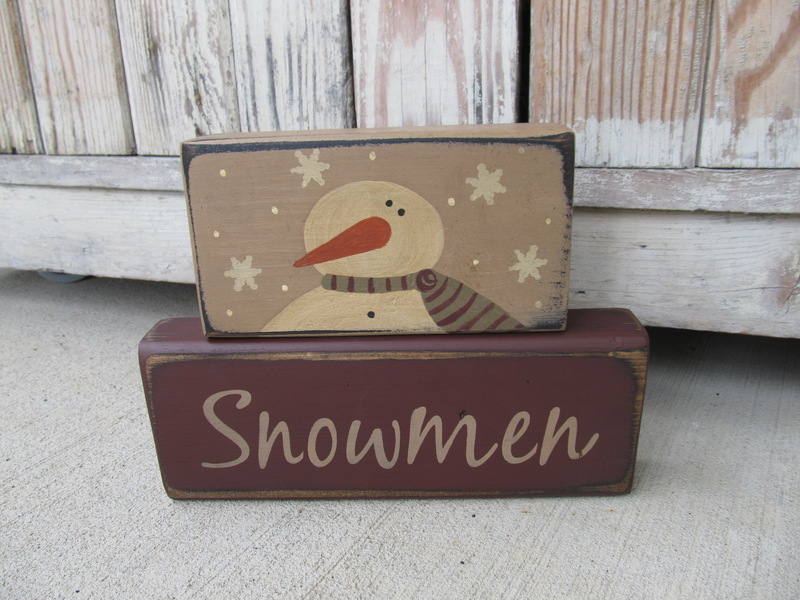 This block set features a burgundy block on the bottom, with khaki tan stenciled word SNOWMEN. The top block has a khaki tan background with a hand painted snowman with a pewter green scarf with burgundy stripes and snowflakes falling around him. The stack as shown measures 9" x 7" tall. 2" thick so they stand up nicely. Featured in the November 2017 issue of the Country Sampler Magazine. Hand painted, designed and signed by Heidi.